Do you have suggestions for presentations or programs you would like to see at membership meeting? Click here to send Dave an Email! CABTC is excited to offer this opportunity to check out our new site and try out the turf! Please share with your friends, invite your classmates. A Standard course will be offered after regular trial classes are over, estimated start time is 2:30 pm or so. Sign up Saturday for $12 per run for either an Ex, Open or Nov STD. Toys may be used, no food. Maximum time will be set at 90 seconds. REWARD (petting and toys!!!). Check out the turf, see the expansive crating and warm up area!! 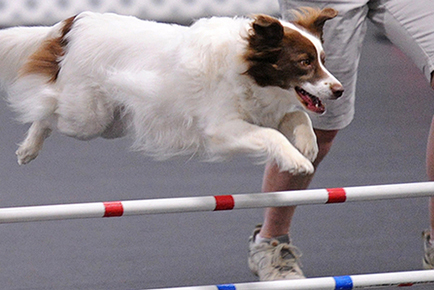 Give your young dog show experience where you can play and reward great behavior!! If you are coming for the B Match come around 2:15 so you can walk and we will start when the last class is over. Of course you are welcome to come earlier and help in the rings to get things moving faster! This is an estimated start time, so please be patient. Bring your retired partner who would love to run with you. Try out your up and coming young star, warm up your competition dog for their Sunday runs or just end the day with some fun with your dog. Matt Twitty is the owner and operator of Lakeland Canine Academy. Since 1999 Matt has been showing his dogs in competitive dog sports (Flyball, Agility, Herding and Rally) as well as doing in-home behavioral lessons but his main focus has been on Competitive Obedience Training. SPRING IS IN THE AIR AT CABTC! MAY 2019 AKC SCENT WORK TRIAL! Save the date: The next ACT event will be July 27th!! We had a great turnout in March are looking forward to having folks return, as well as welcoming newcomers to the sport! Details to follow at later date. 2019 Agility Trials at CAPS Field House! Click Here to View Flyer!! Wondering where to you can eat or have a beer with your dog in Cleveland?? Check out this Blog site!